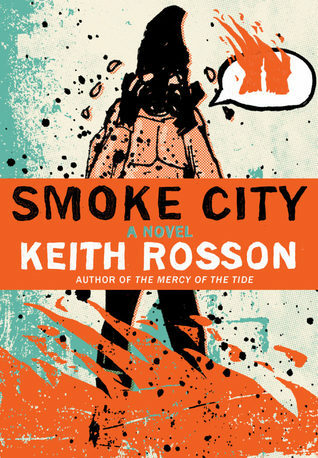 Smoke City follows the journals of Marvin Deitz, the modern reincarnation of Joan of Arc’s executioner, as he takes one last stab at salvation. His story is crossed with and reflected by the story of Mike Vale, once famous for his art, now a sad wreck of a man also in search of absolution. The book immediately engaged me with the introduction of the smokes, figures that appear and fade away in increasing numbers across Southern California and Mexico, and particularly urban centres like Los Angeles—who knows why? In Rosson’s book, the paranormal rapidly becomes mundane, exemplifying the idiom “familiarity breeds contempt.” This sullying of the incredible is disturbingly easy to visualise. This is a book that isn’t about saving the world, but about saving souls. The themes of guilt and redemption are taken beyond a single lifetime. Marvin’s punishment and his ultimate goal have stretched through centuries. His chance for redemption and release finally comes when he hears Joan of Arc has also reincarnated. He urgently needs to make it to Los Angeles to find her. Mike’s journey also takes him towards Los Angeles, with the aim of finally doing right by his ex-wife, the person who means the most to him. The cycle of suffering Marvin experiences is replicated daily in Mike, who swears off alcohol repeatedly, but is inevitably drawn back. The characterisation in this novel is exceptional. I was immediately immersed in the lives and sensations of the characters, and soon felt I knew them intimately—perhaps uncomfortably at times. The detail in the description brought me close enough to smell the blood dried on Mike’s pillow, and see the maggots in the flesh of Geoffroy Thérage’s torture victims. Rosson has poured in historical research to make sure his brutal picture of life in 15th Century France (and beyond) rings true. Mike Vale owns the story as much as Marvin Deitz. For a while, despite enjoying Mike’s intense character, I questioned Rosson’s purpose in having him in the book—especially when the pace of the action slows towards the middle to fill in the history of his relationship with his ex-wife. Later I couldn’t imagine the story without him. Metaphor and simile bring extra depth to Rosson’s writing style. “Lava, hot and malicious” compresses itself behind Mike’s optic nerves. The smoke on the floor is “curled like an apostrophe.” Throughout the novel, Mike Vale’s story is told in third person, while extracts from the journals of Marvin Deitz are first person. I found this mix of perspectives refreshing; it was done well, so it never confused. Keith Rosson is making a name for himself as a genre-defying author, and this book fits that description. Perhaps magical realism would be the best label for his work. I enjoyed his blend of literary drama and the supernatural, and I’ll be looking out for more of his work.